Josh Dean, one of the founding editors of the late PLAY, The New York Times Sports Magazine and occasional sportswriter for Rolling Stone and Outside, will be writing every weekday for The Sports Section about the World Cup. 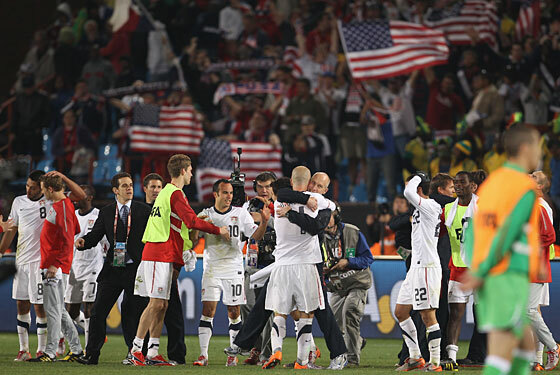 Today, one more look back at yesterday's staggering U.S. victory. I've had a few hours to digest this one and I'm a little more reasonable now. For one thing, my hands are no longer shaking, which makes it easier to type. I'm still convinced that was maybe the greatest single game moment I've ever experienced live, but now I've had time to take it all in and to get swept up in unreasonable expectations. I now believe the U.S. team can go far. First we need beat Ghana, which is the kind of thing that seems easy when you say it out loud. Ghana! How can we not beat Ghana? Well, there's this: We didn't beat them in 2006 — Ghana was the team that knocked us out of the last World Cup, when a win might have put us through (not that we deserved to advance). This is a different Ghana team. They might be better, but they're also younger. They lack their best player and leader Michael Essien, the Chelsea star, but are loaded with the kinds of big, strong, fast players who could give our defense fits. They will bring the game to us, opening up the field for our own attack, but also forcing our defense to, you know, defend. Which isn't always its strongpoint. I've been down on Team USA's defense for weeks now, and certainly the guys tried hard to get things off to a familiar start by giving up an early, ugly goal. Jay Demerit whiffed on a long ball, giving Rafik Djebbour a clear shot on goal that drilled the crossbar. It was Algeria's best chance, and it came just six minutes into the game. From that point on, though, Demerit was a monster, winning every challenge and heading away any ball that came within twenty yards of his large and pasty head. Carlos Bocanegra, playing center back in place of that ineffective giant Oguchi Oneywu, was nearly as solid. Steve Cherundolo was again awesome on the right — continually threatening the Algerian flanks with runs that looked positively Brazilian — and even Jonathan Bornstein, the one player I hoped never to see on turf in South Africa, wasn't terrible. Actually, that's not fair. He was more than decent. He was even pretty good. It's actually hard to pick on much of anyone in our lineup. I was only hard on Clint Dempsey because I expect so much of him. He is our most talented player on the ball, the rare American who can create something out of nothing. (Also, he did score a goal, if only we were allowed to keep one now and then.) Donovan, too, could have been better, but he was there when we needed him. Bradley, well, I already told you how I feel about the coach's kid. The one player I was probably hardest on during the game — the guy I seemed to be screaming at most often — was Jozy Altidore, our prodigal 20-year-old striker. Often, Jozy seems to force the play, dribbling unnecessarily when a pass would be smarter, but although he's yet to score himself, he is almost always a factor in our near misses. There's no excuse for the easy goal that he shot into orbit midway through the second half, but what he does bring to this team is a large and constant threat that scares the crap out of defenses. I saw a stat today that really stood out: Altidore has drawn six yellow cards from opponents, including three in the game versus Algeria. We're not where we are now without him, and I still believe Altidore will score a big one for us before this thing is done. By the way, bully for England. I took some pleasure in seeing the French go home embarrassed, and obviously I wouldn't mind if the Italians were to follow, but I have to say I'm happy that England is sticking around. And bully for the Socceroos. No team got off to a worse start than Australia, which was steamrolled by Germany in its opening match, losing star midfielder Tim Cahill to a red card in the process. But the Socceroos tied a tough Ghana team, and finished with a win over Serbia. For a minute there it seemed like Australia, the team I wrote off after one game, could advance to play the U.S. But it wasn't to be.